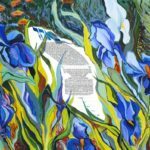 A ketubah in the artists' classical style with the quotation from the Song of Songs, “I am my beloved and my beloved is mine”. Signifying enduring love, depicted by the rose and the lovebirds. The ability to customize the monogram above the rose is also available. 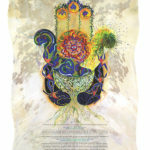 The Golden Leaf Green Mist Ketubah contains lots of bold colors and organic imagery. The text in the middle is highlighted with it's framing and color. This artwork is as eternal as your love for each other. The flow of water, nature, wheat, barley, and olive leaves are all symbols of purity and wealth. The dancing figures symbolize the festivity of life, and enduring fiery energy in both body and soul. The tree of life at the base of the palm contains the word Chai (Life) in its roots. 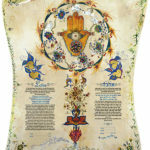 The Children of the Sun White Ketubah exhibits beautiful design emphasized with a white background and striking colors. Nava took a very powerful and important symbol of the sun and added organic color and texture. The framing goes all the way around the text to really bring it out in a beautiful and artistic way. The creation of life and energy through the unification of human and nature. “Ki Haadam Etz Hasade”-Quote at the base. soil, water, air, and fire (sun). Human beings also require the same basic elements. 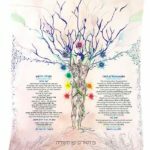 The 7 Chakras interlaced with the 7 Levels of the Kabbalah tree of life. 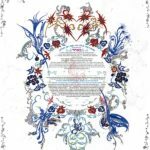 This ketubah design is called Dreamcatcher. 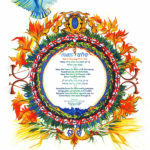 A dove and a circle made of different layers of a variety of leafs are part of the imagery that adorns this ketubah design. 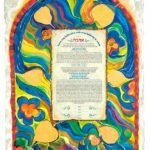 The Golden Leaf Beige Ketubah exhibits a white framing around vibrant colors and a whimsical design. The background of tons of colors really brings forth the text. 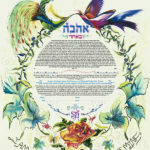 This Ketubah is perfect for the couple that is looking for a striking design to go with their new life together as one. 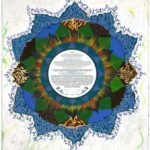 The Hidden Place Ketubah has this peaceful circle surrounds with many motifs from Chinese folk art. The butterflies- a symbol of joy, Wedded bliss. The Phoenix- symbol of Empress, goodness, beauty long life, warmth, prosperity, peace, the sun The birds, Cranes, represents Longevity. The garden, a vast of vines, grapes, pomegranates that represents the seven species. Needle work of swans at top corners, delicate thins pens with an awesome light design. The butterfly in the center will enhance the text, with it’s beautiful light background. The Iris is named after the messenger of the gods and the rainbow linking earth with other worlds. The flag iris is supposed to have saved the life of sixth century Frankish king Clovis who saw flag irises growing in the Rhine River and so knew it would be shallow enough to cross and thus escape his enemy. Irises have been grown in Japan, China, Siberia, and almost the entire temperate world. 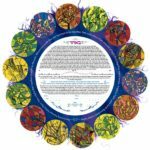 The Jewish mystical doctrine known as “Kabbalah” (=”Tradition”) is distinguished by its theory of ten creative forces that intervene between the infinite, unknowable God (“Ein Sof”) and our created world. Through these powers God created and rules the universe, and it is by influencing them that humans cause God to send to Earth forces of compassion (masculine, right side) or severe judgment (feminine, left side). 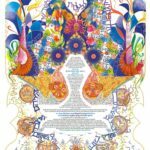 The Milk and Honey ketubah by artist Nava Shoham depicts the seven species with which the land of Israel is blessed. 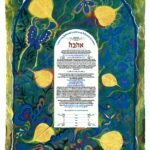 This ketubah is available with a white or blue backing.